Once Upon a Tower is a fun tower smashing endless runner arcade game presented by Pomelo Games, available to download from the App Store and Google Play. 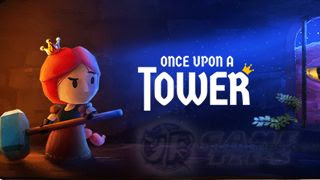 Once Upon a Tower is an action game where you play as a princess trapped in a tower after being kidnapped by a big red dragon. Instead of waiting for her prince charming to come and rescue her, she uses a war hammer that is left behind by a brave knight instead, to fabricate her own escape. On her way out of the tower, she will face several enemies and obstacles until she stands before her final hurdle: the mighty dragon. - This awesome game is pretty easy to learn and play, just plan your moves ahead, observe your enemy's movements, attack patterns of obstacles, then proceed. Capture Fireflies and Collect Coins! - Capture Fireflies and defeat enemies along the way to collect Coins, use them to purchase Power-Ups between stages. - Collect Fireflies and fill up the bottle to 100% to unlock a new character! - Complete Challenges to increase the Firefly Multiplier at the end of your run. - If you can't complete a certain quest because that item or monster is nowhere to be found, well, just try and go deeper to unlock more nasty enemies and obstacles. - Available at the start of the game, and appears randomly in-between stages. - Watch an ad to receive a Companion, or a random Power-Up, try your luck! - Getting a Power-up ain't easy because those Power-Ups are really good if you can get them from the start of your run. - Also note that you can also receive a random "box" at the start of each run. 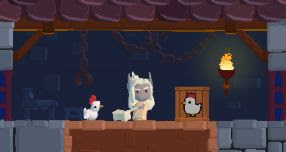 - Used to complete certain challenges like "Complete a Level with a Chicken". - You may also use them as cannon fodders against those spiky objects, or as decoys for some enemies. - Note: Prices of Power-Ups increases as you clear more stages. So plan ahead or skip some stages and earn more Coins. - Covers open and spaces and blows up breakable obstacles or objects. - Recommendation: Always carry a bomb with you, also recommended as your first Power-Up purchase after the first stage, just in case. - For collecting Fireflies that you can't reach, only works 1 block away from your character though. - Recommendation: Not really recommended, as you can reach most of them anyways. - Allows air control, and will let you reach certain areas that can't normally reach. - Recommendation: Very situational, could be useful for certain stages as you go deeper, and will require player skill to accurately pinpoint where to land. - Hits nearby enemies upon landing (1 block from your character only). - Only works against enemies, except those spiky ones, they can hurt you. - Recommendation: Pretty good if you don't have any better Power-Ups to get. - Has a pretty good buff to let you ignore those spiky obstacles or enemies! - Recommendation: Grab it whenever possible. - Increase your attack range, very useful for most situations! - It can help you hit floating Fireflies 2 blocks above you, or hit those pesky enemies from a distance. You can also use this to clear out any obstacles or enemies below you while falling down. - Saves you from harm once. Not cheap, but still highly recommended to get. - Just before the start of your fall, you can also hit other enemies that you can reach, including those that are above you. - Once you land, watch out for enemies that might drop from above you, spam some upward attacks to cover you character. - You can push those wheelbarrows or crates to destroy spikes and enemies. Be aware though because dragons and other enemies or obstacles can also use these items to hurt your character. - Avoid or quickly escape levels where the dragon can unleash it's fire breathing attack. - You can hit back those fireballs to destroy those fire throwing obstacles. - You can use the "Save Me" option once to continue your progress. 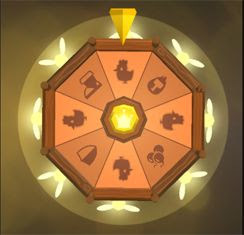 - Sometimes when the Wheel of Fortune in-between stages doesn't work, the Power-Ups that you can choose from will refresh to a different set after the game restarts (only works once). - So if you don't like the current set, try to hit that ad if it's available.